We know you love telling us about your glamping experiences – and we love hearing about them! So all this year we're giving you an extra reason to get scribbling, as we team up with the delicious food aficionados at Eat Natural – makers of all things natural, tasty and good for your tummy. That's right, every single month, we'll be drawing a winning reviewer and sending them a seriously snack-alicious hamper full of breakfasty treats, including a box of super granola and some packs of tasty, natural breakfast bars. Did you enjoy stargazing from a hot tub on your recent glamping getaway? Perhaps you took your pet to enjoy some dog-friendly glamping by the coast? Or maybe you just enjoyed quiet time beside a long-burning stove? Whatever you've been up to on your recent holidays, tell us about your trip and you could find yourself on the receiving end of this mouth-watering monthly giveaway. It's that simple – every new review counts as an entry, and there is no limit to the number of entries you can have. So get reviewing and good luck! 1. This promotion is open to UK residents, excluding employees of Tripadee Ltd, Eat Natural Ltd, their families, agencies and anyone else directly connected with the promotion. 3. Competition Details: In order to qualify for this competition, entrants must submit a user review (50 words minimum) via the glampingly.co.uk website, based on any campsite or glamping site listed on the website. The competition will begin at one minute past midnight (00.01) on Wednesday 1st August 2018. Any reviews submitted before that time will not be eligible. 3.1. Reviews must meet the standard website terms/guidelines which can be found here. Any reviews that contain false information or offensive language will be removed and automatically excluded from the competition. Reviews do not necessarily have to be positive or complimentary in order to be eligible. 3.2 You may enter as many times as you wish, but each entry must be a separate review submitted via glampingly.co.uk. Multiple reviews of the same place will not be treated as separate entries and will be excluded from the competition. 3.3 We accept no responsibility for damage or loss resulting from misdirected or incomplete entries arising from computer malfunction, viruses, bugs or telephone malfunction or other such causes. We are in no way liable for the reproduction or indirect access via third party websites which misstates or omits any of the information or terms and conditions connected with the promotion. 3.4 The winning review will be selected on the 1st day of each month (or on the next working day), starting 1st September 2018. 3.5 The winning review will be selected at random from all eligible reviews submitted in the preceding month. 3.6 The winner will be notified via email within 10 days. The name of the winner may be published on the glampingly.co.uk website, and may be used marketing emails and on Cool Camping's social media pages. 4. 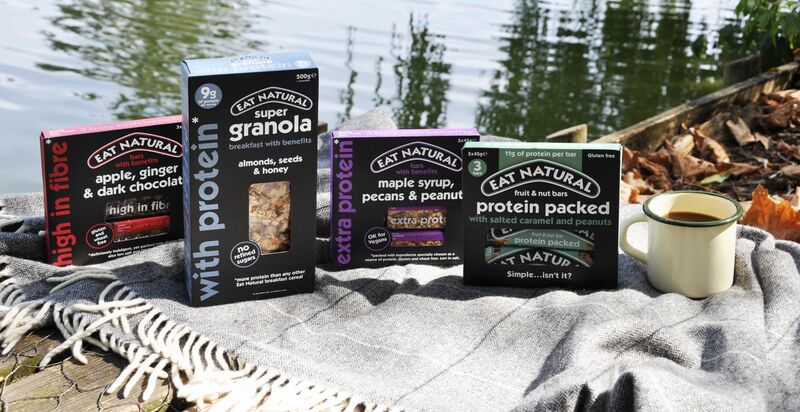 Prize Details: Prize consists of 1 Eat Natural hamper (delivery included) that contains 500g Eat Natural Super Granola, 6x45g Eat Natural Bars With Benefits, 3x45g Fruit & Nut Bars. Contents may vary with variations of breakfast bar flavours likely.